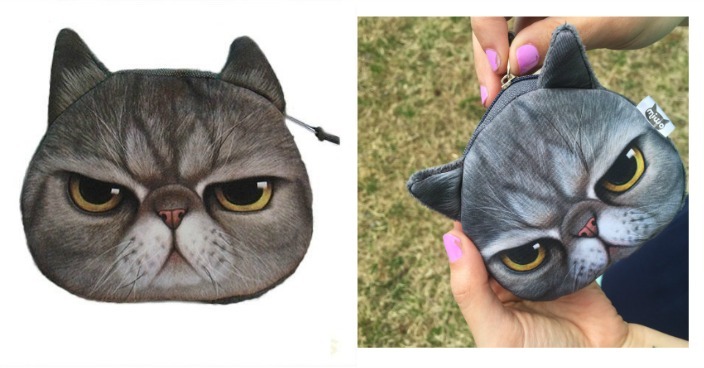 Grumpy Kitty Face Coin Purse Just $3! Down From $13! You are here: Home / Great Deals / Grumpy Kitty Face Coin Purse Just $3! Down From $13! 13 Deals has this Grumpy Kitty Face Coin Purse on sale for $3 (Reg. $13)! You’ll be the pick of the litter with this great grumpy kitty face coin purse. It’s not just great, it’s purrrfect. Kitty features a zipper closure and floral print inside. Front is the Kitty’s face and the back is a super soft gray, almost velvety fabric.